Part of the fun of having a dog is looking at fun dog stuff and admiring all of the cute puppies. Below you’ll find everything from fun dog gifts — for both you and your dog — to everyday dog toys and games to play with your dog. 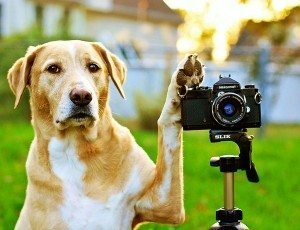 Fun dog pictures – sorted by category, dogs doing fun things. Dog photography 101 – fun tips for taking better dog pictures. Cute puppy pictures – everyone enjoys looking at cute puppies! Dogs wearing costumes – a collection of dog Halloween pictures. Reader-submitted dog pictures – your favorite dog photos & dog photo contests. Dog flower arrangements – how to make dog flowers as gifts. Best dog poop bags & dog poop bag holder – who knew?! Gifts for dogs – gift ideas for birthdays & other fun holidays. Dog birthday cakes – where to buy & how to make dog cakes. Must-have items for dog walks & car rides – dog supplies every dog owner needs. America’s funniest home videos – the best dog videos ever featured on TV. Dogs wearing hats – several videos of dogs wearing hats, wigs & other headwear. Slow motion dog videos – amazing footage capturing dogs in slow motion. Music videos featuring dogs – the best rock & roll music videos that have dogs in them! How to draw a dog – this video shows you step-by-step how to draw a dog. Indestructible dog toys – if your dog chews thru dog toys, try these super durable ones. Kongs are the best dog toys – see why; plus fun ways to use Kong toys with your dog. Dog birthday party ideas – fun ways to celebrate your dog’s 1st year or every year! Buster cube vs Kong toy – see why these are the top 2 interactive dog toys. When your dog won’t give you the ball – if he’ll run after the ball, but not return it, here’s what to do. How to create a motivating dog toy – what to do when your dog won’t ‘play’. Dog eyesight facts – wondering if your dog can see what you see on TV? How dogs communicate using their tails – see what your dog’s tail is telling you. Dog and human similarities – everything from behavior to dog toys and dog supplies. How dogs communicate – learn to read your dog’s body language. Dogs can spell words – maybe dogs can’t speak words, but here’s proof that they can spell them! How smart is your dog? – a fun 5-minute test that puts your dog through various challenge and scores him. Dog allergies and how to treat them – dogs suffer from allergies too; 4 most common dog allergies.